We treat real people, not just conditions. We understand that in today’s world, most people don’t want to just take a drug or over-the-counter medication to mask symptoms. We also know that know that going to the doctor can be stressful too. 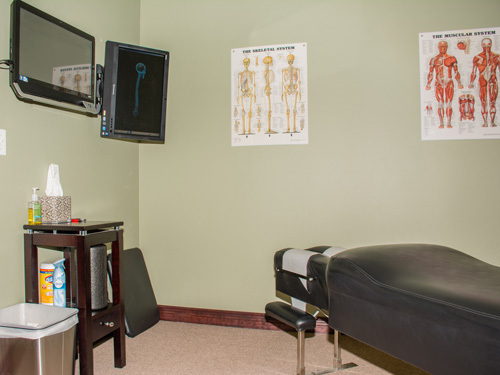 Our goal is to make you as comfortable with our facilities and services as possible so that you can focus on getting back to health. 1st day: This is when we gather information by performing a consultation, examination and if necessary we take x-rays. Intake paperwork is available on our website so you can print it off and fill it out before you come in if you like. The initial visit will take approximately 10-20 minutes. It is important that we take time to analyze the information so that we may find the best way to serve our patients. Typically we suggest coming back the following day for the report of findings. If it is something that the doctor can help with, he will proceed with treatment. This visit typically takes less than 10 minutes. Regular office visit: After a treatment plan has been established, the following visits will be scheduled according to the treatment plan. Patients will receive chiropractic treatment then will be placed on a therapy table (if the doctor recommends.) These visits usually take about 5 minutes.